­I have carried a newspaper cutting around for years – the short article speaks of a school in England who made the pupils who got detention listen to classical music and write down William Blake’s lauded poem Jerusalem – thus learning it by heart. The result was less truancy and fewer misdemeanours by the repeat offenders. I have carried this small piece of newsprint around with me because it spoke of a resounding truth – the power of the inspired written word, the eudemonic and enlivening nature of beauty and the exceptional perspicacity of human kind (in this instance the staff) to meet wrongdoing with a redemptive activity. This small obscure article held one of the alchemical secrets of healing and yet for many it would have been lost in the hubbub of inconsequential news. Many of us know that the learning of a particular verse or prose can help to engender a sense of self and offer a source of resolve and transformation – it can become a mantra of sorts. As Buddha said ‘with our thoughts we make our world’. The right verse, the right poem can lift us from the profane into the extraordinary and transformative. Living into imaginations such as those provided by Blake can re-enforce and instil visions of courage and spirit that lie within us: Bring me my Bow of burning gold; Bring me my Arrows of desire: Bring me my Spear: O clouds unfold! Bring me my Chariot of fire! Imagine if we were to wage all our personal battles with such vital imaginations! Everyday we go to battle in one way or another – by simply living in the world as it is today – by simply being human. We are constantly challenged by the frenetic nature of human existence, we have personal, inter-personal, professional, environmental and societal pressures to overcome. How do we do this with dignity, honour, compassion, strength, enthusiasm and a sense of our true self? We need to prepare ourselves, to cloak ourselves in what can be called ‘spiritual armour’ ––­ armour that we ourselves have created through our own inner striving. Every time we put our will and effort into self-development, whether it be doing basic soul development exercises, meditating or by corralling ourselves not to be distracted by something mundane or profane and to put our forces into something ‘worthy’ – we strengthen our spiritual muscles – we become more inwardly robust. We also develop perceptions and heighten our sense of the super-sensory. 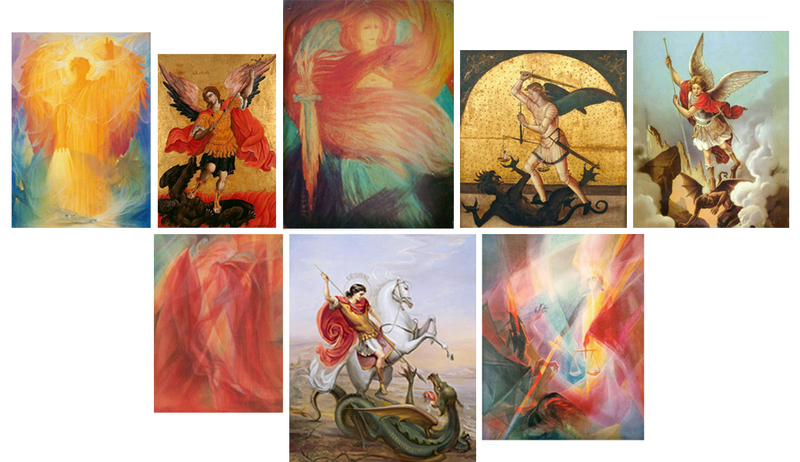 The renowned depictions of Michael and the Dragon can speak of our own personal power to transform our personal demons. We all have ‘shadow’ aspects of ourselves that need the sword of courage and discernment to redeem them. In our darkest moments the shadow aspects of ourselves can ‘act’ out like beasts manifesting as anger, guilt and fear. The more we develop ourselves the more we can become a witness to our own personal beasts and the very particular ways they manifest – this is key to self-transformation – to observe and become an objective witness to who we are. To be a strong warrior of the 21st Century has little to do with physicality or wealth (certainly these are powerful currencies today) but to be a true warrior in todays world we must cultivate our Higher Self and tread the path to self-knowledge. To not cease from mental fight, to not let the sword of discernment sleep in our hand – but to build a deep sense of our higher self within our very own being. By transforming ourselves, we transform the world. Our imaginations become our reality. Michael, also known as St. George, is commonly depicted in full armour overcoming a dragon. Historically he is personified as an Archangel and bearer of cosmic wisdom and intelligence, symbolically represented by his sword or spear Ascalon – the holy weapon of perception. While Michael wants humans to develop a consciousness that is shone through with cosmic wisdom, inspired from every person’s Higher Self, the dragon wishes for humans to live an instinctive, dark, animal-like existence, yet illuminated by cold unfeeling intelligence. Sometimes, in these depictions of Michael and the dragon, a maiden – a symbol of the human soul itself – is seen in the background bound to a tree. She is a prisoner of these lower soul forces. 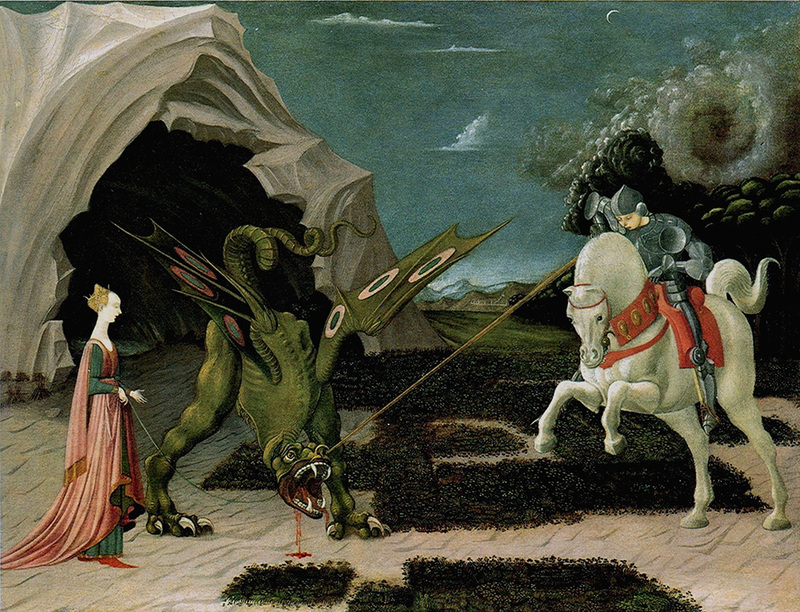 Uccello painted this theme but in his version Michael has wounded the dragon. The maiden, no longer bound to a tree, has the tamed dragon on a lead. In the background is the dragon’s cold, crystalline cave.